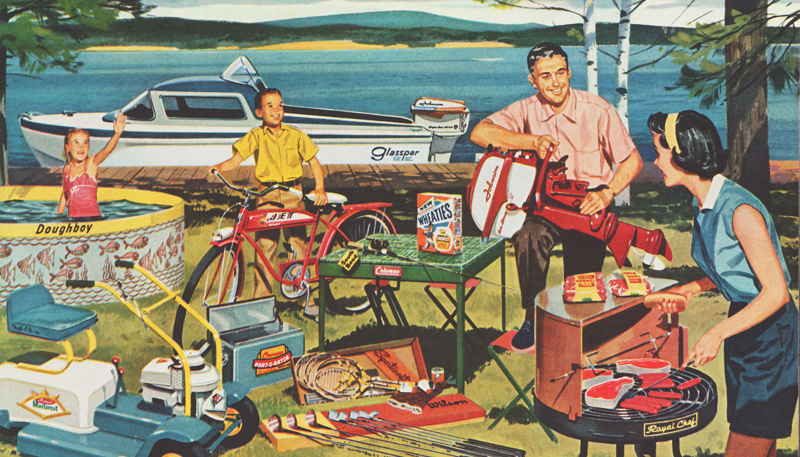 For over half a century, Americans soaring confidence had always promised a sugar-frosted future filled with frost free fun and abundance and economic prosperity. But that Buoyant bubble of optimism has since gone bust. Along with our jobs, retirement funds and split level homes, the American Dream has gone into foreclosure. If I had a time machine I would love to go back and live in the 50’s. Life seemed so simpler then. Great blog and fantastic images! If cartoon character Mr. Peabody’s WABAC time machine could transport you back to the 1950s, you would find that “seemed” is the operative word.Though there was less ambiguity than there is today which made it seem simpler, the unbridled optimism co-existed with a very real fear of nuclear annihilation that would chase us all through the decade. If you were wealthy, white, male and straight, the 50’s were just swell. Otherwise, the 50’s was pure hell. Aria – you nailed it. Sally, Aria – you nailed it. What I’d like to go back to as an adult was the time in my life where all my grandparents were alive and we kids were the center of their universe. There was alot of the 1950s still alive in their home – the positive parts of the 1950s – and this was in the 70s and early 80s. My wife and I have tried to have a home life like that for our kids – no great clouds of doom hanging over our family’s heads, living with the limitations of the modern American budget (avoiding debt), and making do and making it last. I have fixed many things over the years. Why toss something out when a repair will give that item another decade of use? One of the ways has been by cutting the cord on cable TV. We stream Netflix, Hulu, Amazon VOD and whatever we can from the websites like ESPN (World Cup Soccer is this week). We have PLENTY to watch. This has kept out a great deal of advertising and the (I think) negative influences of modern pop culture – pick your favorite bad-boy or bad-girl from the headlines this week. It isn’t a choice grounded in religion or anything like that but an effort to simplify home life a little. To avoid the distraction of advertising and mindless consumerism – and everything seems to be part of advertising these days. We have acquaintances who have done more extreme versions of this including home schooling and not owning a TV. Not our goal or method. Our kids know who Justin Bieber and Kim Kardashian are but we have unplugged from the advertising mechanisms that the modern American experience has become. I was a proud father when my kids complained about all the endless commercials on cable TV during the holidays last year. I inadvertently tested this 20 years ago when I lived in Europe for a few years without English TV and no telephone. There was so much more to think about and do without TV and advertising leading my attention and my wallet around. This all might seem odd but it goes back to debt and consumerism. So many of our peers are ruled by ever aspiring to have all the “best stuff” and replacing it often. It’s a treadmill for them. Work hard, buy lots of stuff – garage sale it off for pennies on the dollar and buy more stuff. Is there any marketing aimed at Americans of African decent? If so you all should try posting it along with all the other stuff. Aria, There was plenty of hatred inculcated by the predominantly WASP 1 percent toward Roman Catholics, Italians, Germans, Irish, Russian,Jewish,Japanese,Chinese, Mexican/Latins, et. al. Americans as well. I lived through it. These monsters found pitting Americans of Sub-Saharan decent against Americans of European decent; using the tendencies of humans to self-segregate. It worked. And is still working. I also remember everyone at that time speaking the same kind of English. Eventually adding gender, life-styles, and political affiliations to the mix. All of us have been played. Now we need to get over it so they will know that we stand as a people and that we’ve had enough. As one approaching ‘fossil-hood is still find myself concerned for the young people of any stripe. If the American Experiment as envisioned by the radicals of this new idea of a republic fails, and it is at the end point in my estimation; you will really see what ‘Hell’ is like, closeup and touching. Let’s finally identify our true enemy Capitalism. Which by the way was condemned by the Papacy at the close of the nineteenth century. And try not to estimate the importance of using the same language. Divide and Conquer. Cui Bono. Think about it. P.S. To the above: Don’t forget Education either. Knowledge should match up between all of us. Public education has been used to dumb-down all of us who are native born and to keep us at each others throats. Ask as the Romans did ‘Cui Bono?’ i.e. ‘Who Benefits?’ follow it to its source and not what appears to be obvious. The rest of us have been played for way to long. Pax to all of you asking the questions. Educate without dissing or yelling to those you hope to influence. that image is disturbing the more I look at it. Why does the man have an outboard motor on his leg? What is a “Doughboy” brand swimming pool? Why do they have an above ground pool on a picnic near a lake? With a lawn mower? They sure seem happy though. Glad you enjoy the images. That particular image was from a Wheaties cereal ad for a contest displaying the abundant consumer items that could be won by some lucky people. “Doughboy” was a popular mid century brand for plastic inflatable water items from pools to toys. Even as a child, I rather felt that the American way was boring. I wanted freedom and back yard cook outs were anything but. Hi Sally, I love your blog! I have always been fascinated by the post war optimism and prosperity, certain ads like the above make me feel a certain way I can’t describe, eventough I am not a U.S citizan and born in ’85. Pingback: Newco Shift | Our Consumption Model Is Broken. Here’s How To Build A New One.